Precision and advanced non-surgical removal of Moles & Skin Lumps without compromising your appearance. ​Evidence of skin check-up with your GP or skin cancer specialist is important. A simple skin check appointment within the last 3 monhs with your GP is sufficient, so please bring your appointment details (doctor name, practice name and date of visit). No specialist referral or letter is required but it is adviced, however details of your visit is needed. We can determine if something is suspicious and in most cases moles may not even be an actual mole and are simple dark solar lentigo or reddish cherry angiomas which can also be treated and cleared but we do not make any decision or diagnosis whether a mole is potentially cancerous. For your safety and peace of mind we recommend to have a full analysis of your mole(s). We can refer you to a specialist doctor if need be. Final quote will be determined during your initial consultation. Discounts may apply for multiple moles/ lesions. Please click here to schedule a FREE* consultation & skin analysis online instantly. If required, skin resurfacing is later performed to ensure texture is aesthetically normal. 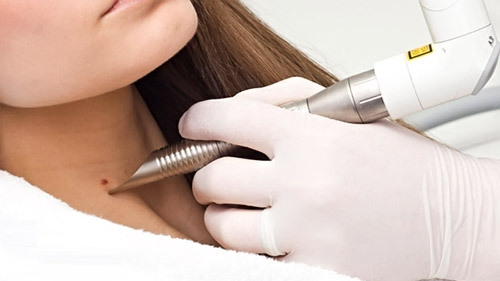 Cosmedix Clinics offers advanced precision non-surgical laser mole removal that is an effective, safe and aesthetically appealing alternative to the cut and stitch technique. While surgical removal of flat and raised moles are still predominately performed, people forget we live in the 21st century and non-surgical developments far exceeds traditional methods of cutting skin tissue to remove benign moles in safety and more appealing skin texture. While many clinics still offer the cut and stitch method, people have come to accept this as being the only way to remove moles but in reality is considered a harsh method for removing non-cancerous lesions for aesthetic purposes only. The result typically causes scaring of the skin and unsightly marks to areas commonly visible areas of the body such as the face, head, neck, back or chest. This in-turn makes the procedure less then ideal to go through as the mole(s) are much better off left untouched. The specialists at Cosmedix Clinic have developed a unique two-step technique to precisely flatten and de-pigment raised or flat benign moles and permanently damage the root of moles so skin is returned to normal colour and texture for good. The procedure is quick and after some initial minor healing, skin will once again be apart of the even complexion of surrounding skin. If you have been always wanted to have clear complexion on your face or body from unsightly moles and have been cleared of potential pre-cancerous lesions by your GP or specialist, then you are an ideal candidate for laser mole removal at Cosmedix Clinic. Simply schedule your initial consultation for an accurate treatment plan and pricing, you wont regret it. The procedures we adopt are not only safe but highly precise so only the mole is treated and surrounding skin is left untouched. Our procedures are safe on any part of the body including the face. If anything, in rare cases, minor texture difference may be slightly visible but we address any skin irregularity until both the client is happy and skin is aesthetically looking good. what is the difference to surgical mole removal? The advantage of technology has allowed skin practitioners to offer highly effective procedures with less side effects and so the main factor between surgical intervention and laser is the significant degree in skin damage and scarring. While surgical intervention is required for problematic moles and pigmented lesions, in majority of cases laser is not only suitable but far more effective without the need for stitches or potentially damaging procedures like nitrogen (cryo) therapy. However, some moles may require follow-up treatment do to the nature of the deep seated pigment cells that can potentially regenerate the mole. While laser carefully removes the mole, sometimes it does not reach the deep cells to completely remove the growth factors of the mole, however this is addressed with a follow-up treatment. Nonetheless, it is still a much more preferred method avoiding stitches and scarring. Mole removal procedures are performed under local anaesthetic with minor discomfort if any. The lesion is immedietly cauterised after the procedure which limits bleeding and a crust will be present for a few days. Appropriate after-care will be explained to ensure optimal healing but the skin most avoid water contact during this period. There are methods in place if this is hard to avert.